last year, in an effort at career development, i took a course in presenting. as an exercise, the instructor chose a student and proceeded to ask us questions to which she asked we respond based on our perceptions of him. is he married? (yes) does he own a home? (yes) where was he born? (no, not india. he was born in canada.) that kind of thing. the questions kept coming and it was remarkable how easy it was for us to not only have an opinion on whether he plays sports (badminton, so…sort of? :P) but also a consensus. (we said no) the message the instructor was trying to deliver was that no matter how much we want to give lip service to the contrary, a person’s presentation does affect our opinion of them. (the lesson was to always present well in every sense of the word.) i cursed that instructor for not choosing me because, boy, did i wish that i could’ve heard what kind of impression i give off. nathan’s belief was, in essence, an extension of the exercise we’d done in that class. i’ve often marvel at the mystery of looking at my reflection in the mirror. i am very aware of how i look to me, but i spend a lot of time wondering the ways in which i am perceived differently by others. just as my relationship with another person colours how they look in my eyes, so our visions of ourselves are tinted. in much the same way as people react to hearing their recorded voices, that’s how i look at photos. when i see myself in a still, it enables me to separate from all the attachment i have to how i look and get a glimpse of the person i am to other people. i’m not sure how other people see me and i’m not particularly concerned about it. curious would be a much more apt term to use. i’m just curious. i don’t know if it’s obvious, but the kitchen and i have got a love-hate kinda thing goin’ on. i like the end product of having something healthy to eat and taking care of the people i love. i find it pretty fun to try new stuff and feel accomplished when a new recipe turns out well or i hear kevin tell me i’m an amazing cook. yes, i enjoy cooking, but i also kind of hate the time it consumes. that was evidenced by the mini-meltdown i had yesterday midway through creating my tomato soup. i looked at the clock and realized that since i’d been home from work, i’d spent nearly every minute standing there in front of the stove. it was nearly 8pm and all the time that i could’ve spent doing my version of fun stuff had expired. hmph. fortunately, i had kevin around to laugh in the face of my despair. literally. just a note: that goddess bowl was phenomenal. i ate way too much of it as a result. 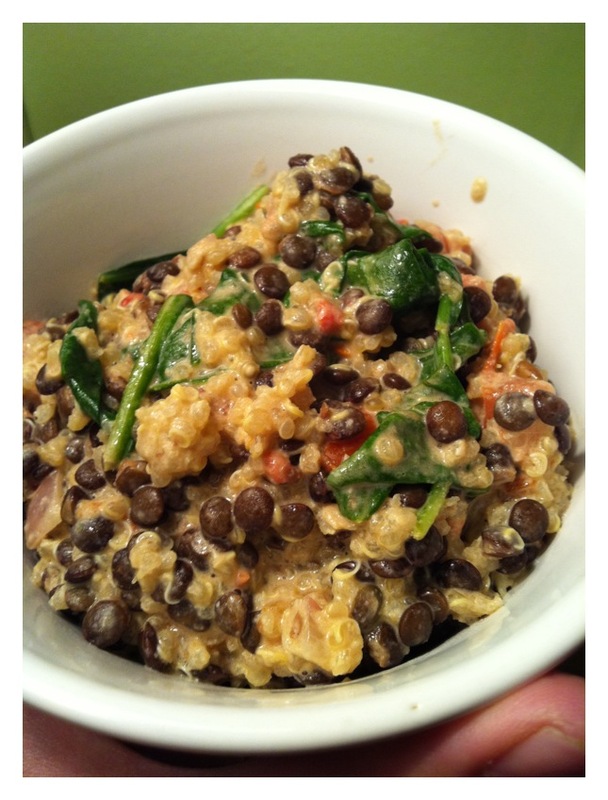 lentils, quinoa, spinach and other goodies with a lemony tahini sauce. i’m still full, but even that isn’t stopping me from imagining another bowl!